The soup and sandwich combo of your dreams! 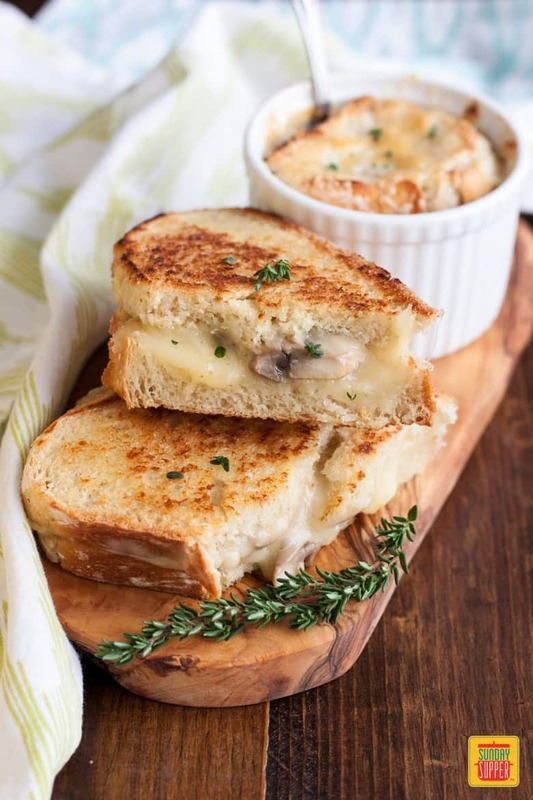 The flavors in our Mushroom Grilled Cheese and French Onion Soup make a magical combination. Your taste buds will SWOON! Enjoy this soup and sandwich pairing for a comforting lunch meal, weekday supper, or even a casual Sunday Supper with the family gathered around the table. 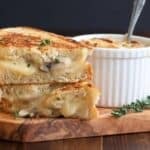 Soup and grilled cheese is one of my favorite comfort food combinations that can be customized to easily please the whole family. 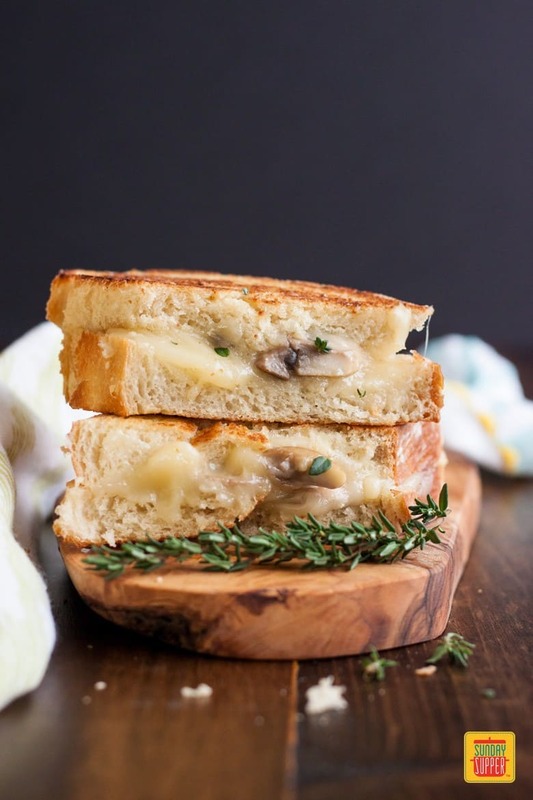 Today I’m sharing a recipe for French Onion Soup with Mushroom Grilled Cheese, because there’s nothing better than cheese on top of cheese! I chose to use Fontina cheese for both the soup and the grilled cheese. But, like I said, you can customize to your taste easily by changing up the type of cheese to use. And if the kids don’t like mushroom, then hey more for you. I tried making this soup with sweet onion and found that it is too sweet for my taste. Regular yellow onions (brown onions) works fine for me. However, you could use a mixture of sweet onion and yellow (brown onions). You have the option to deglaze with some white wine or red wine before adding the rest of the beef broth and let the soup simmer. For me, the wine was too strong so I omit the second time I made this. If you want a lighter flavor broth, you could use half beef broth and half chicken or vegetable broth. If you really like mushroom and like to layer it on thick, I would double the amount of mushroom called for in the recipe. This is only enough to spread it out in one thin layer when making the mushroom grilled cheese. I made two loafs of this No Knead Artisan Bread for the soup and the mushroom grilled cheese. But you could always pick up a loaf of French bread at the store to save time. If you want softer, sandwich type bread for the grilled cheese, try it with Brioche Loaf Bread instead. I couldn’t find sliced Fontina so I bought two 8 oz blocks to use for the soup and the sandwiches. However, you can substitute sliced Swiss cheese for similar flavor. Or change it up completely with whatever cheese you prefer for your grilled cheese. I was eating left over French Onion Soup for days, not that I mind it. 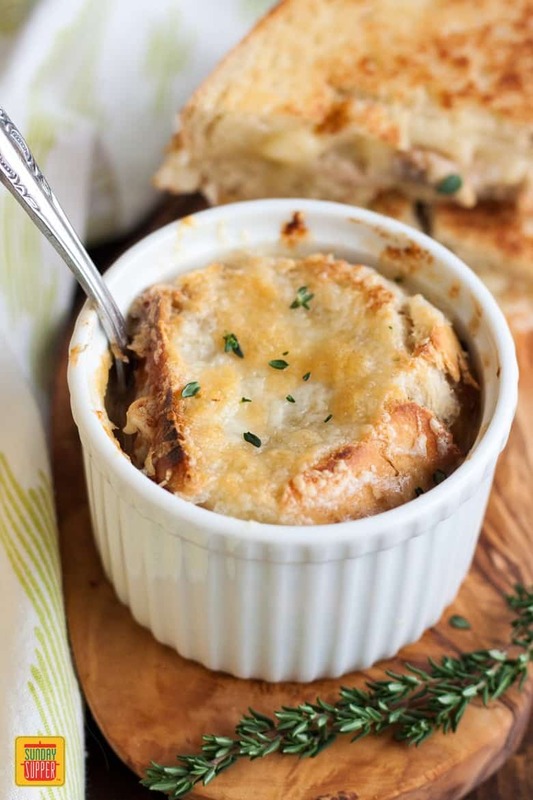 But if your family consists of just yourself and your significant other, I would highly recommend cutting the french onion soup recipe down in half. Other than that, enjoy! Remove the onion ends, slice in half length wise, and cut into 1/4” thick slices. Add olive oil to a large pot and heat over high heat. Add onion, thyme and bay leaves and sauté on high heat until onion is translucent and soften, about 5 minutes. Season with a few pinches of salt. Reduce heat to medium high and continue to cook the onion until soft and caramelized, stirring frequently. As the onion gets closer to being caramelized, the bottom of the pan may start to burn, add a little bit of the beef broth to deglaze it as the onion continues to cook. 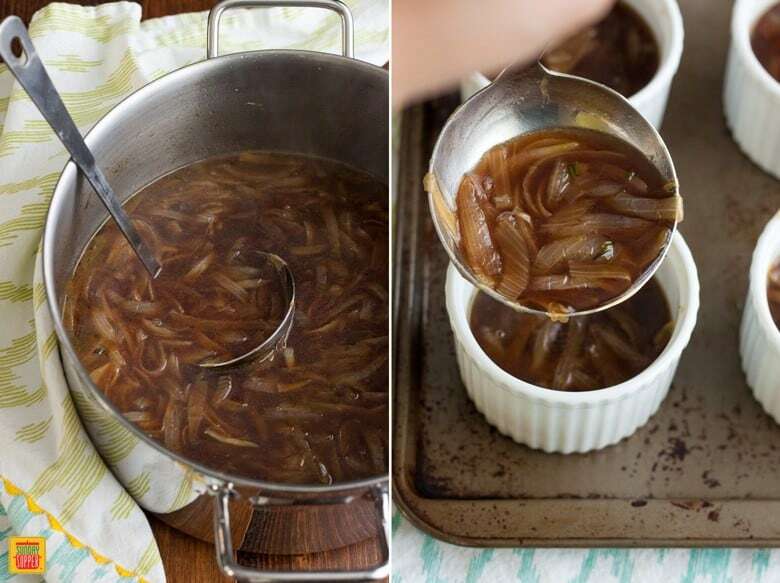 When the onion is a deep golden caramel color, about 25 minutes, add the rest of the beef broth to the pot. Bring to a boil and simmer for another 10 minutes, season with salt and pepper to taste. 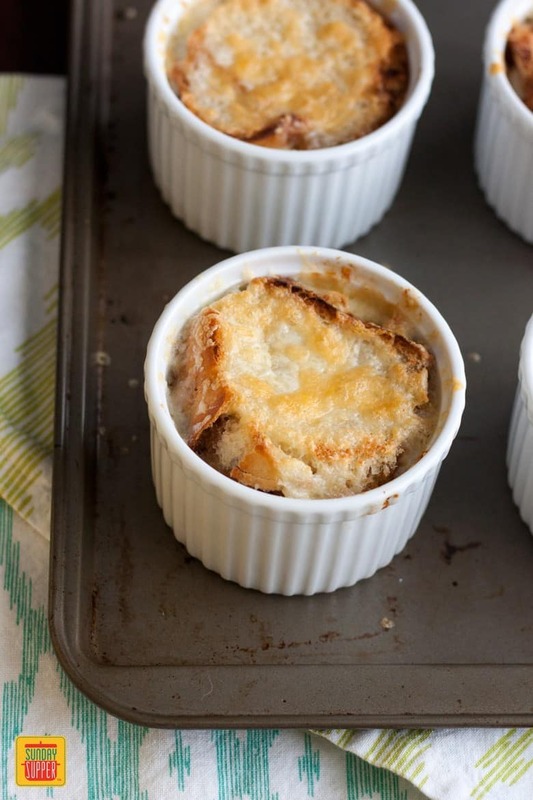 Shred or grate the cheese, slice to bread into 1/4” - 1/2” round slices that will fit the mouth of a ramekin or oven safe soup crock. 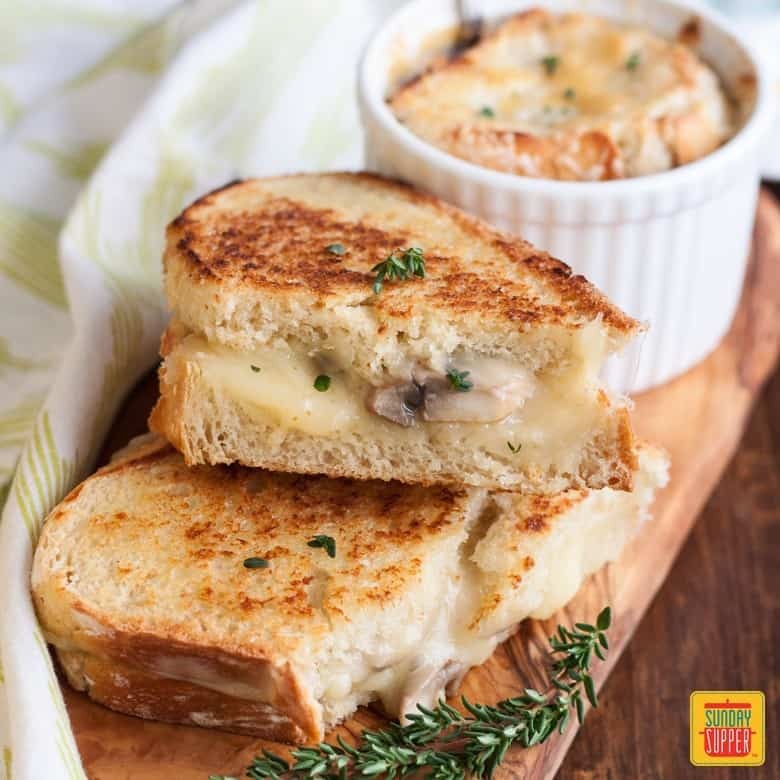 When ready to eat, place a slice of bread on top of your soup and top generously with grated Fontina cheese. Slice the block of cheese into thin slices or use sliced deli cheese. Remove thyme leaves from the sprig. Add mushroom and thyme to the skillet and cook until mushroom is softened but not mushy. Slice the loaf of bread into 3/8” - 1/2” thick slices. Spread 1/2 teaspoon of butter on one side of a slice of bread. Place the butter side down on the cutting board and place sliced cheese on top to cover the slice of bread. Spread a quarter of the cook mushroom on top of the cheese. Add more cheese on top of the mushroom. Spread 1/2 teaspoon of butter on one side of a second slice of bread and placed the unbuttered side on top of the loaded slice. Place a skillet over medium heat, and use a spatula to transfer the prepared sandwich to the hot skillet. Fry until the bottom of the sandwich is golden brown. Carefully flip the sandwich and cook the other side until golden brown and the cheese melted. Remove from heat and repeat with the rest of the ingredients. A cheese lovers jackpot! I often order French Onion Soup when I go out. I got to try this combo at home! What a wonderful combo!!! Mushrooms will be in my next grilled cheese!!! I’m going to try this with all veggie broth and extra mushrooms. You can’t beat grilled cheese sandwich and soup. Yumm! A double dose of cheesy bready goodness. Sign me up!